A final decision to combine the second and third of three planned Commercial Orbital Transportation Services (COTS) demonstration flights (C2 and C3) for SpaceX’s Dragon capsule still hasn’t been made, although a major hurdle – namely approval from the Russians – now appears to have been removed. 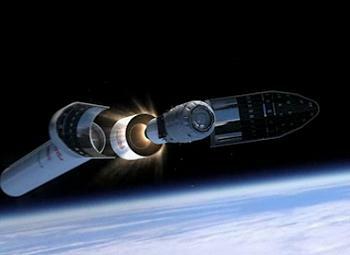 While initial concerns were raised with the “performance data” supplied to them from the COTS 1 flight – as much as it appears the issue was with the amount of information they gained, as opposed to any problems with the data – sources have pointed to the Roscosmos and RSC Energia “stakeholders” signing their approval for the arrival of the SpaceX vehicle at the orbital outpost “in recent days”. When this mission will take place is still undecided, ironically due to the Russian effort which requires a successful return to flight their Soyuz launch vehicle, following the Upper Stage failure which resulted in the loss of mission with their Progress 44P resupply ship. Part one of that return to flight effort was passed successfully, via the launch of a Soyuz lofting a Kosmos (Glonass-M) satellite into orbit last weekend – as much as this vehicle did not share the Upper Stage commonality with the Progress launch. That test will come on October 30, when a Soyuz will launch the Progress 45P resupply ship to the ISS. Should that mission all go to plan, the path will be clear for the mid-November launch of the Soyuz TMA-22 spacecraft, with three members of the next expedition. 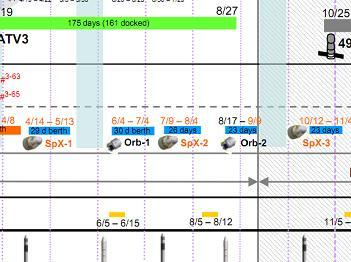 These missions need to avoid any setbacks, especially with a deadline approaching where the ISS could be decrewed. As a precaution, NASA managers overviewed numerous decrewing presentations at a recent meeting (all available on L2), as much as this major scenario remains highly unlikely. However, until the Soyuz has successfully returned to full operations, SpaceX must wait to see where they will fit into the schedule, not just from a vehicle manifest standpoint, but from an ISS crew standpoint, given Dragon’s debut arrival will require a large amount of robotic operations by the ISS crew. That work, by way of paperwork, has been completed, with over 45 “crew procedure” documents created by the ISS side of operations (all available on L2) on how they will care for the Dragon during its berthing, stay and departure from the ISS. So far, SpaceX have only issued one statement, noting they could be ready for a December 19 launch, as much as it is likely that the mission will head into early 2012, likely January. Dragon’s debut arrival has already received a level of cargo manifesting, with an ISS stowage status update providing some insight into how the ISS will make use of the mission. “Cargo Delivered: Actual cargo growth unclear due to immature manifests; vehicle spacing could increase and impact manifests,” noted the commercial page of the October 5 presentation acquired by L2. Once Orbital have completed their Taurus II demonstration flight – scheduled to take place later this year – their “D1” mission will target the debut mission to the ISS for the Cygnus vehicle on a preliminary launch date of February 23, 2012, ahead of docking at Node 2 nadir, for a 12 day stay. However, this launch date is at the mercy of the aforementioned schedule of missions. The pressurized cargo module (PCM) for its Cygnus cargo logistics spacecraft has already arrived at NASA’s Wallops Flight Facility in Virginia, the location of Orbital’s launch site for these commercial resupply missions. A level of cargo manifest work has also been discussed by NASA managers. 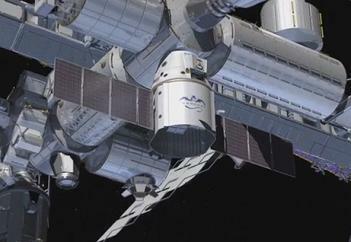 Back to SpaceX, and should Dragon’s ISS debut proceed without issue, the forward plan calls for a major ramp up of SpaceX activity, as they press into their half of the Commercial Resupply Services (CRS) contract. Again, only preliminary dates for these missions exist, due to the need to complete both the Soyuz return to flight, and the C2/C3 mission. However, RSC Energia’s president Vitaliy Lopota personally signed a manifest – last week – which shows the current plan for 2012 and early 2013. This manifest, acquired by L2, shows what would be a highly historic CRS debut for SpaceX, with their CRS-1 vehicle – also tagged as SpX-1, launching four days after the departure of Japan’s HTV-3, on April 12 – the anniversary of Columbia’s STS-1 mission. This manifest also aligns with NASA’s Flight Program Working Group (FPWG) manifest for the ISS (L2), which shows Dragon arriving two days later, on April 14, for what would be a 29 day stay on the orbital outpost. The baton is then handed back to Orbital, who open their CRS flights with “Orbital 1”. 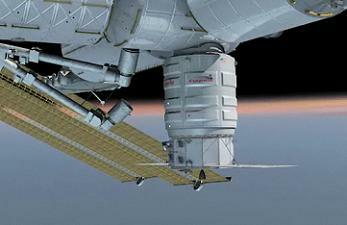 The June 1 launch will result in Cygnus arriving at the ISS on June 4 for a 30 day stay. Should all remain on plan, SpaceX will then launch their second CRS Dragon, currently shown as July 7, 2012, for an arrival two days later for a 26 day stay on the ISS. The pace continues to be high as Orbital then aim to launch their second CRS Cygnus on August 14, arriving three days later for a 23 day stay. 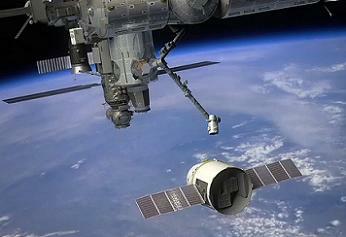 During this period, the European ATV-3 is scheduled to depart from the opposite side of the Station, completing its 161 days on the ISS, a period which will have seen two Dragons and two Cygnus’ dock to the orbital outpost, not to mention arrival/departure activity via Russia’s Progress and Soyuz vehicles. While all these missions remain preliminary, this would be the first tangible signs of the commercial fleet beginning to make up for some of the lost capability since the end of the Space Shuttle Program. While the orbiters had vastly superior upmass and downmass strengths – not to mention numerous other capabilities, not least the ability to launch large crews – Dragon and Cygnus will mark a major new chapter in US domestic space flight. Also, 2012 will still see one more SpaceX Dragon flight, with CRS-3 shown to be on a schedule that results in an October 10 launch, for an October 12 arrival, resulting in a stay of 23 days. This will round off the year for CRS, with the next commercial mission being CRS-4 for Dragon, launching in January of 2013. (Images: Space X, Orbital and L2 Documentation) (As the shuttle fleet retire, NSF and L2 are providing full transition level coverage, available no where else on the internet, from Orion and SLS to ISS and COTS/CRS/CCDEV, to European and Russian vehicles.